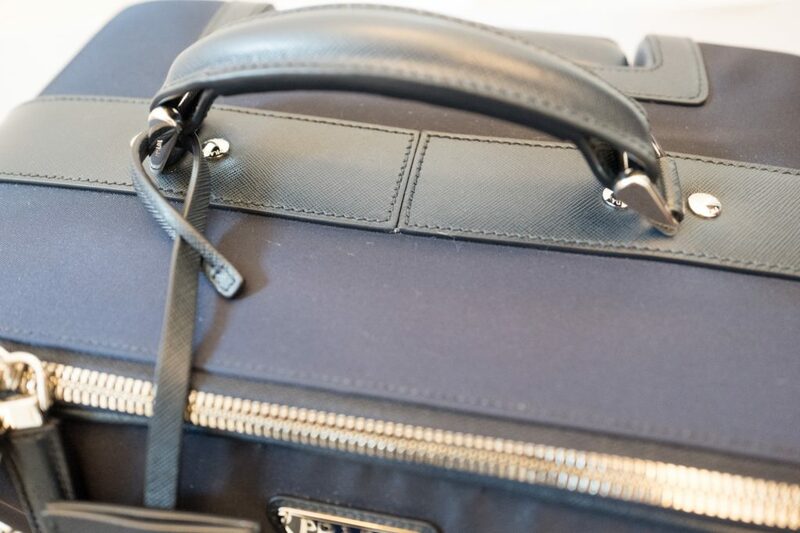 I purchased this blue Prada nylon and Saffiano leather trolley in March 2017 and I had forgotten that I hadn’t reviewed it! Since buying it I have taken it on three trips, the 1st to the Champagne region of France, the second to Barcelona and the south of France and the 3rd to Venice returning home on the Orient Express train. 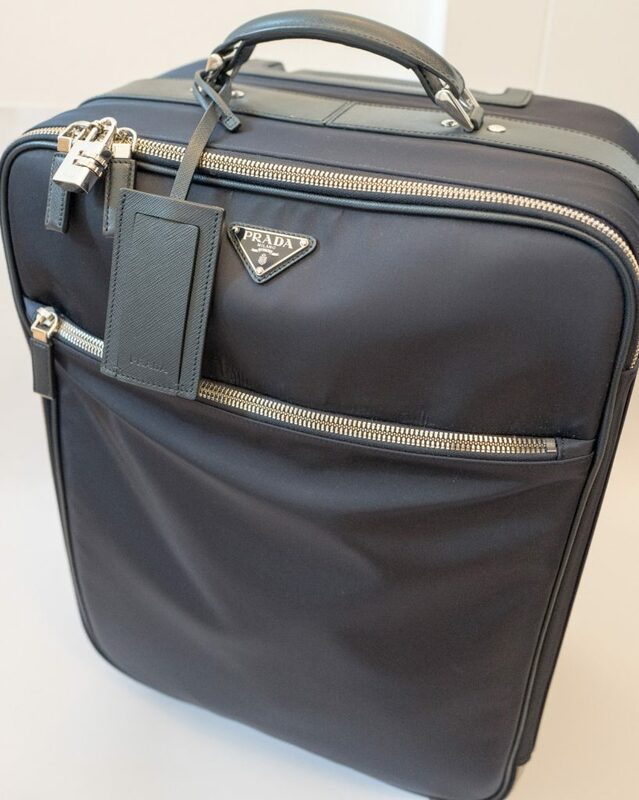 The front of the trolley has the classic Prada triangle logo in matching blue with a leather trim. 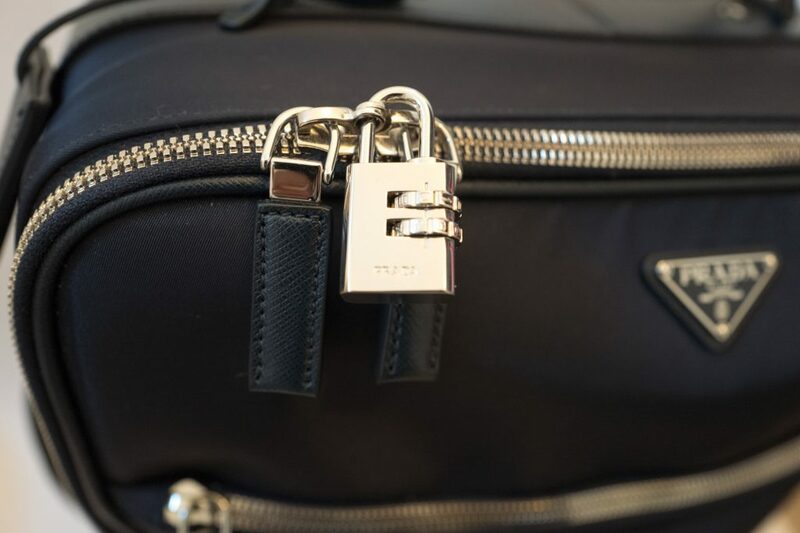 It comes with the classic Prada 99 combination lock in silver as you get with many Prada bags. 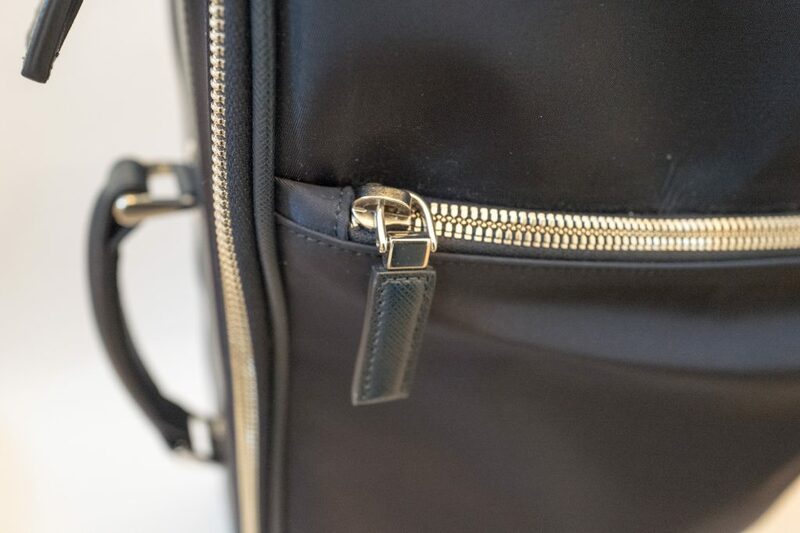 All the zippers throughout are made of Saffiano leather. 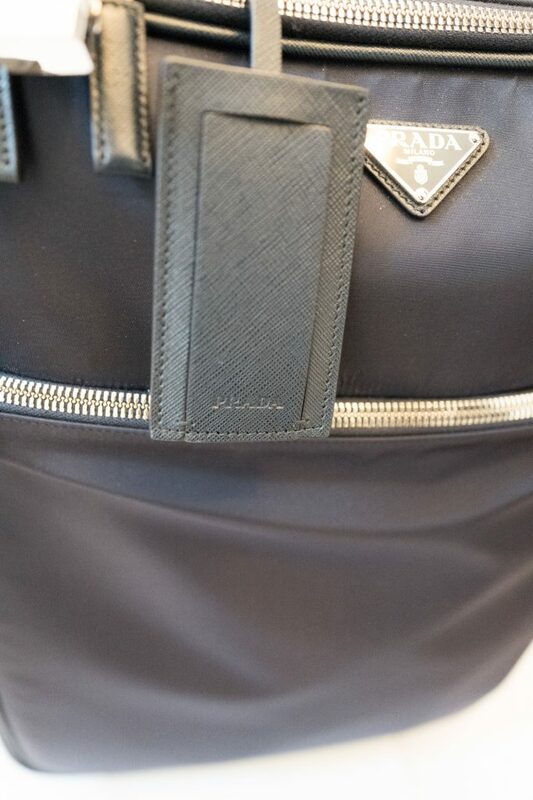 The metal hardware has the Prada logo on it throughout, the Saffiano leather trim really helps the bag standout, I just think the stitching looks wonderful. 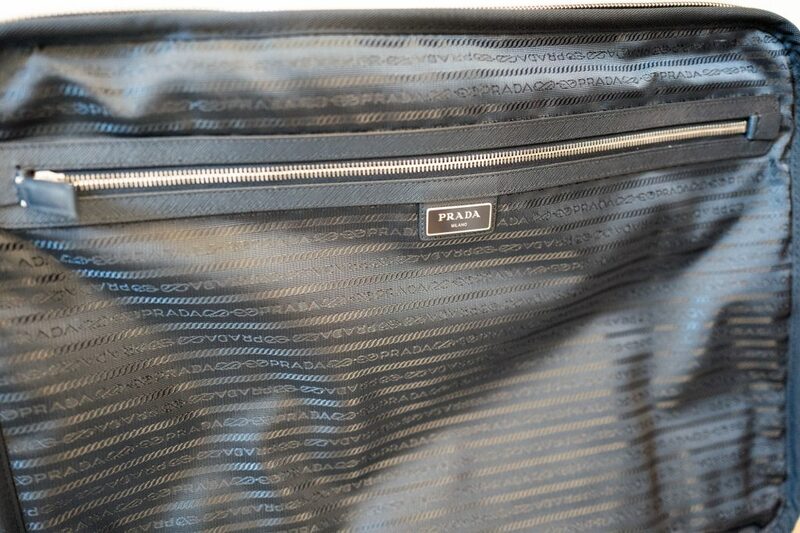 Further Prada logos on the metal handles. 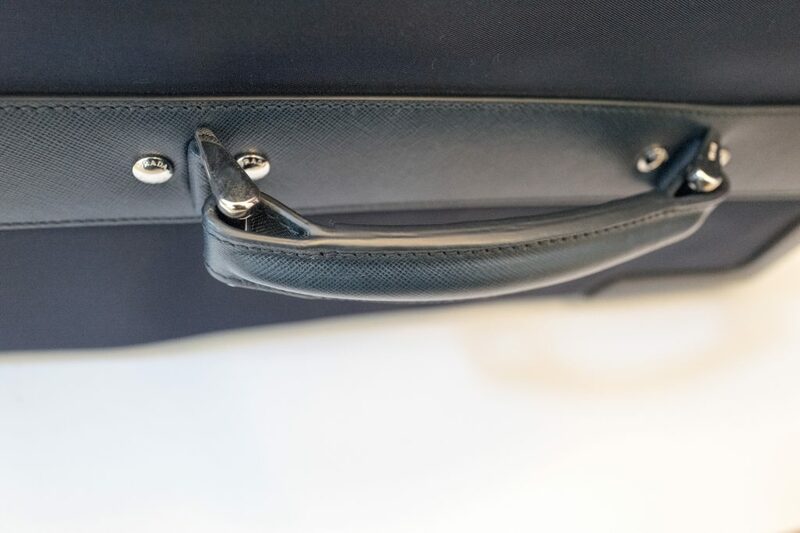 The classic matching Saffiano leather blue luggage tag and a large front zip compartment on the front of the trolley. 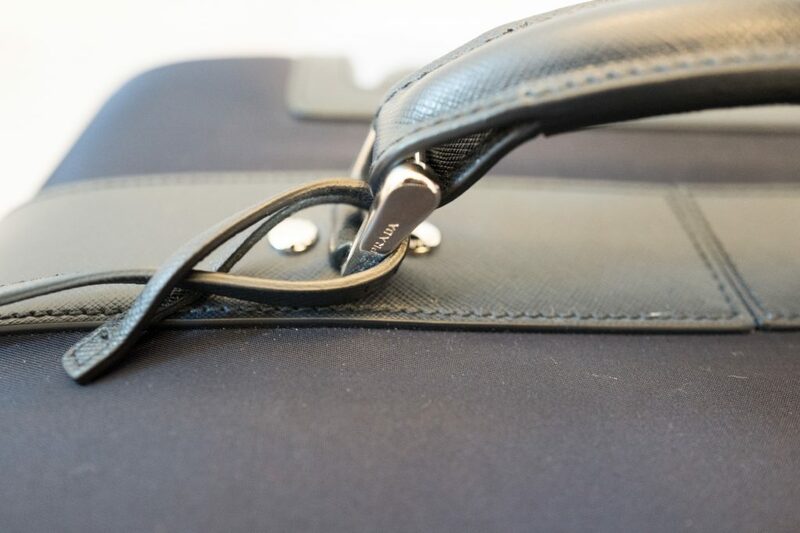 There is a very strong Saffiano leather handle at the top of the bag. 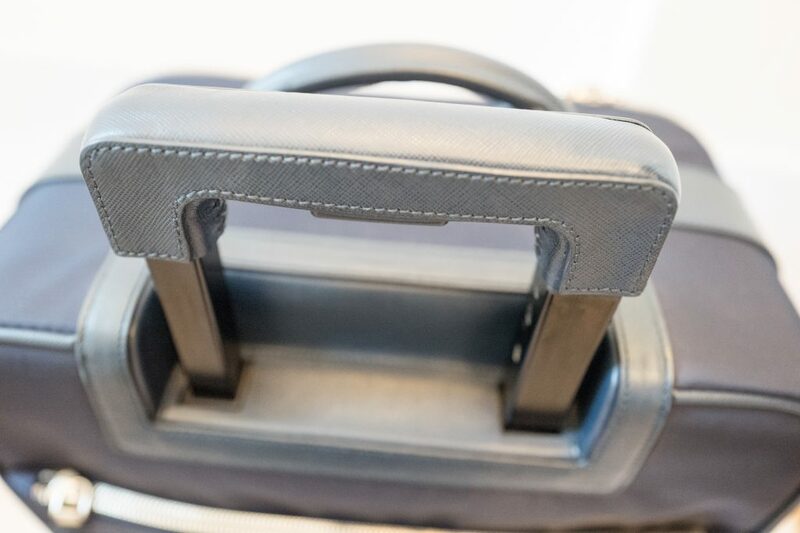 The back handle of the trolley is also covered in Saffiano leather, for when you need to roll the trolley down the street. Further Saffiano leather at the bottom of the handle. 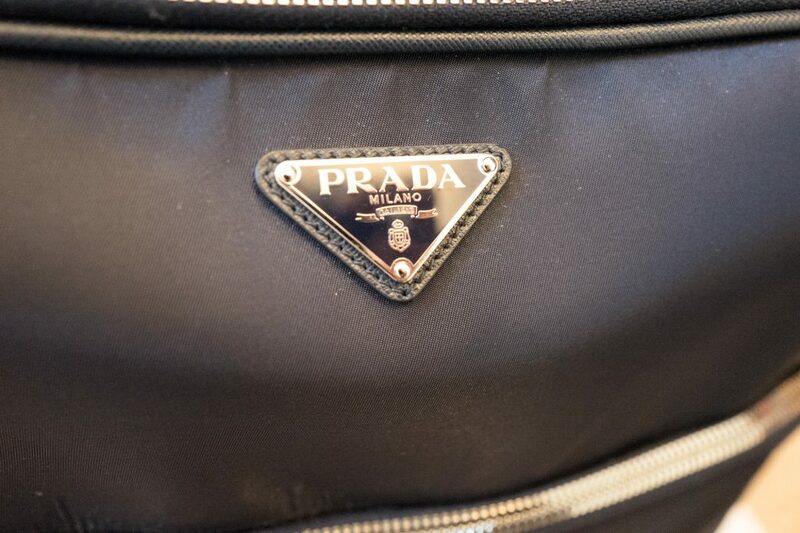 Each wheel has the Prada logo on it and there are black plastic shields surrounding each one, this is to protect the nylon from the ground, I found this works very well when rolling. 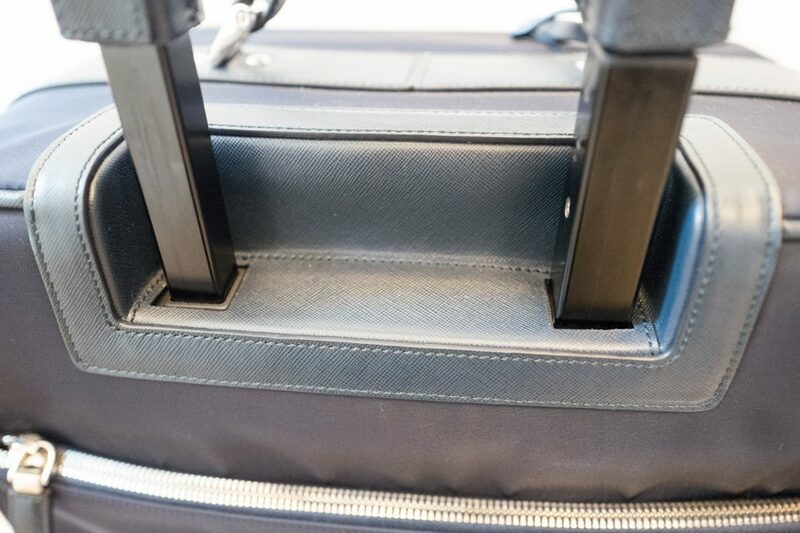 The second strong handle is on one side of the trolley, ideal for moving it around. 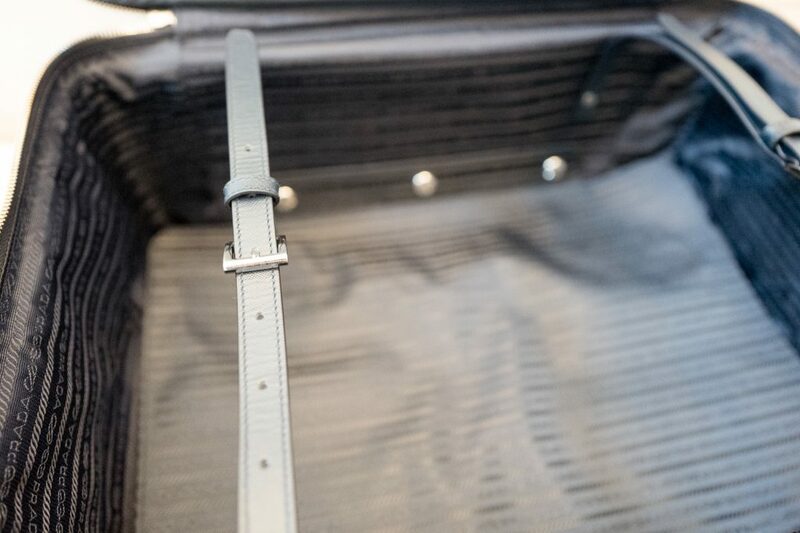 From the right side you can see a distinctive stripe of Saffiano leather that wraps all the way around the suitcase, a nice touch. The stripe follows on the left side where the handle is. 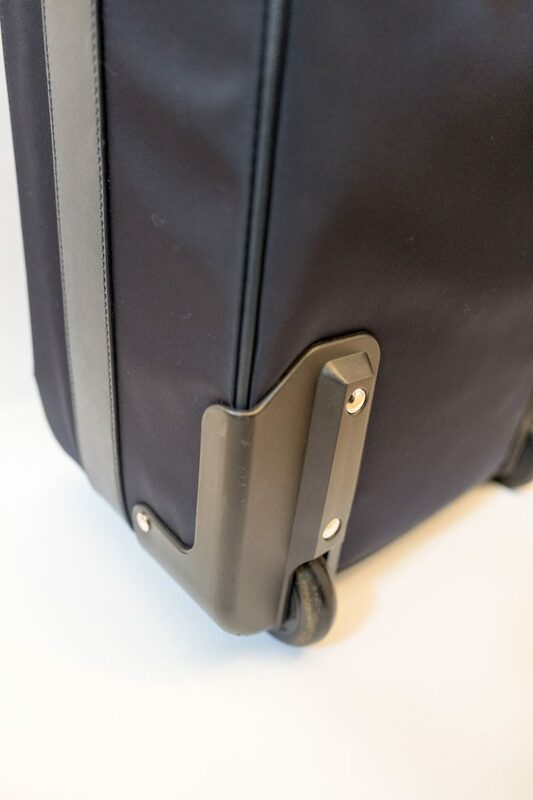 The back of the trolley has another large compartment similar to the one on the front as well as the wheels, shields and Saffiano leather handle for rolling the trolley. 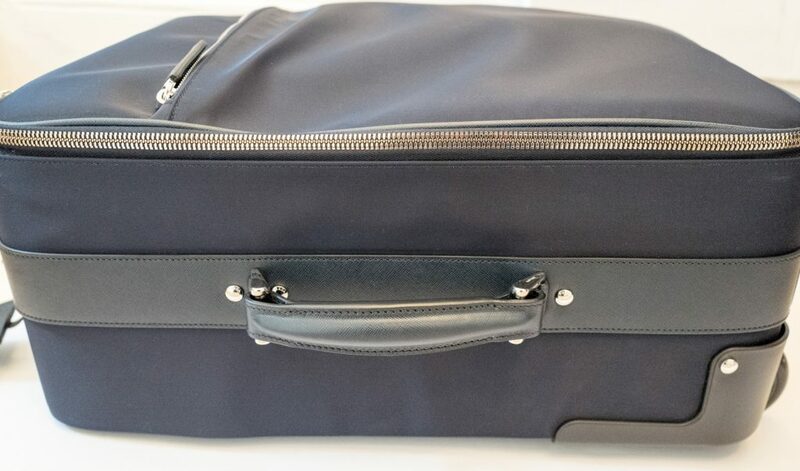 Opening up the large central compartment reveals a classic Prada cloth lining throughout, the lid of the case has a larger Saffiano leather trimmed zipper compartment and a metal Prada logo. 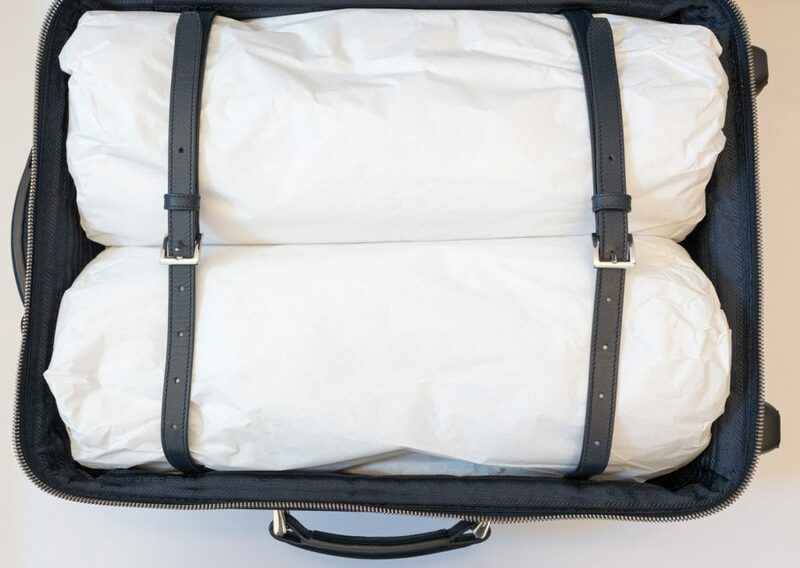 The inside (shown here with paper to keep its shape) has a lot of room for storing all your weekend travel items. 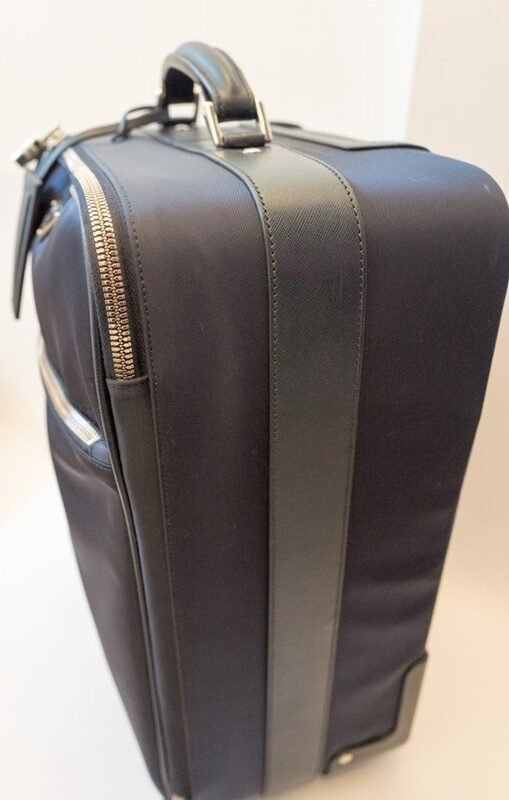 The inside has two Saffiano leather blue straps to keep your items in place when travelling. 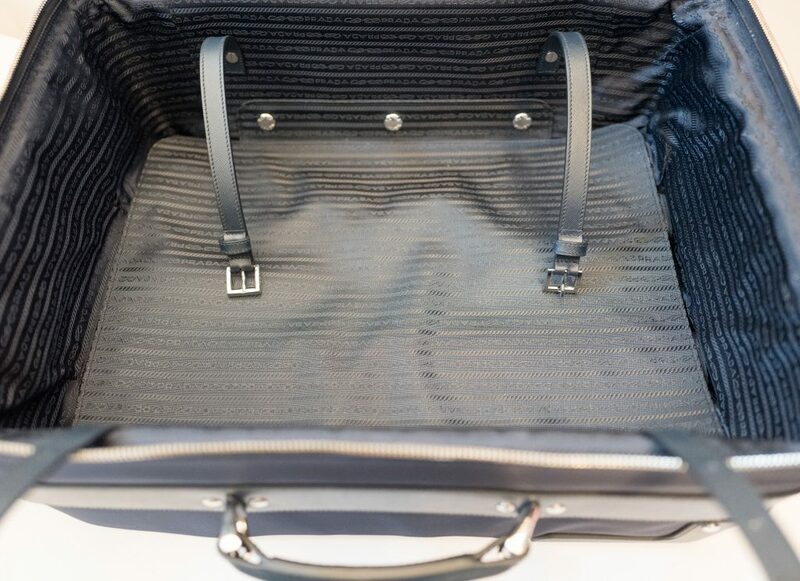 When you remove the stuffing you get a sense of the amount of space you have in the case and the amazing Prada cloth lining. I have now used this case three times, each time it travels it gets a little worn, but this is the life of luggage, what is the point of owning something and not using it, of course I would like it to stay in mint condition but in real life this is not possible, I wipe it down every time it goes somewhere to keep it in good condition and I refuse to check it into hold luggage but that is all I can do. 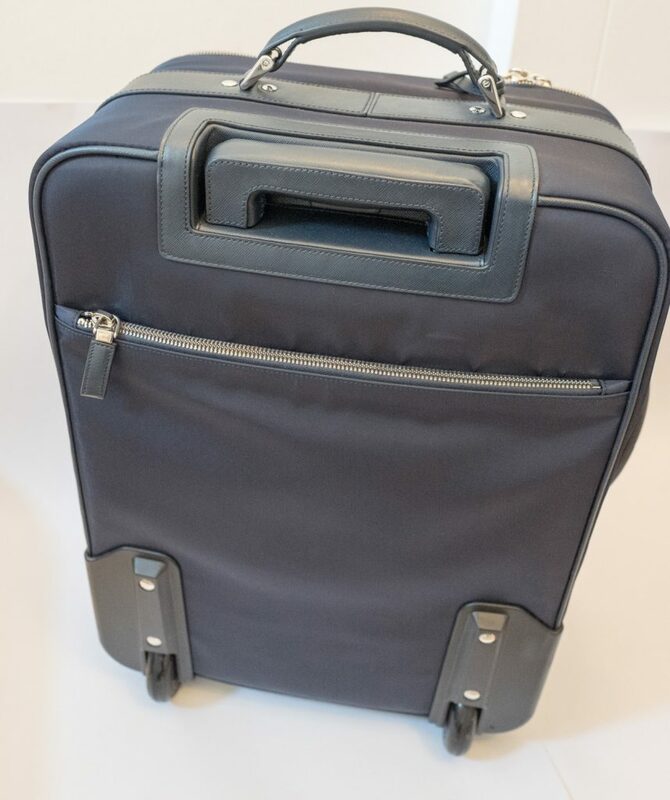 If you are looking for a carryon piece of hand luggage then you can’t really go wrong with this Prada trolley, it has 3 smaller compartments and one central compartment, it is easy to use and extremely well built. 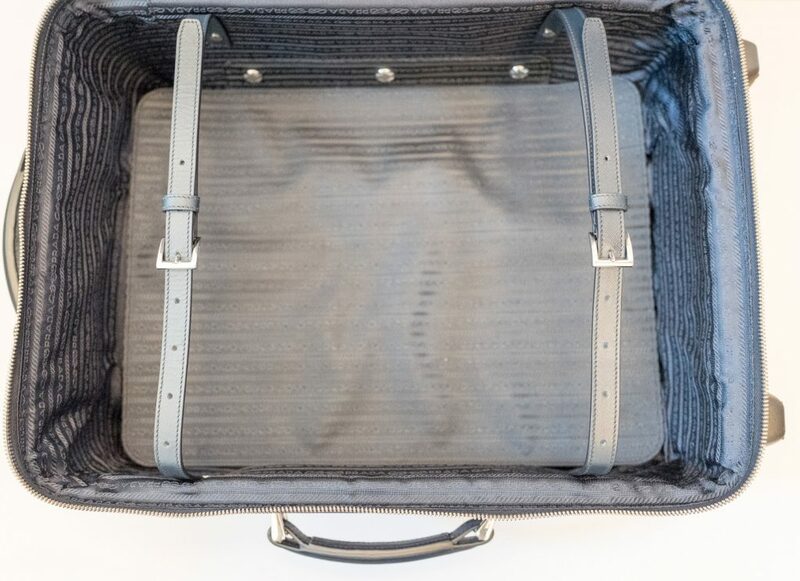 It looks wonderful when you Jetset around, and when you compare it to most other trolleys you can see why you are paying the Prada price tag. 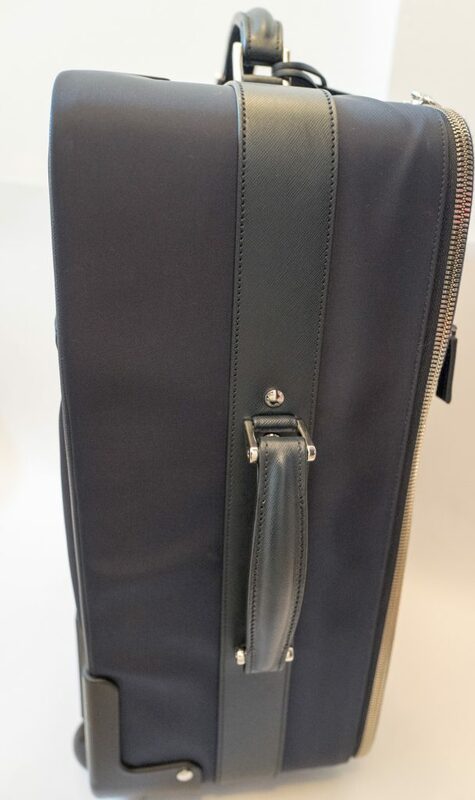 You can get a full Saffiano leather version for £2800 vs £1800 for this version, however for me this is a great piece, once it has had many years of use I will consider the full Saffiano leather version. 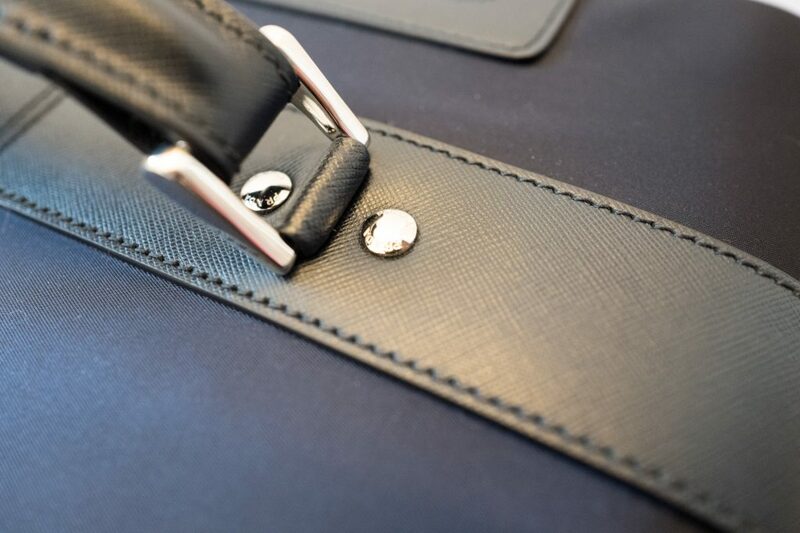 My only compliant is that it doesn’t come with a nylon cover, which you do get with the full Saffiano leather version!